San Jose, CA — June 5, 2017 — Engineer Daniel Sanint, recently recorded vocals for Ingrid Michaelson’s new single entitled “Miss America” at Flux Studios in New York City. The song, featuring Sara Bareilles, is on Michaelson’s new EP Alter Egos, released May 12, 2017. 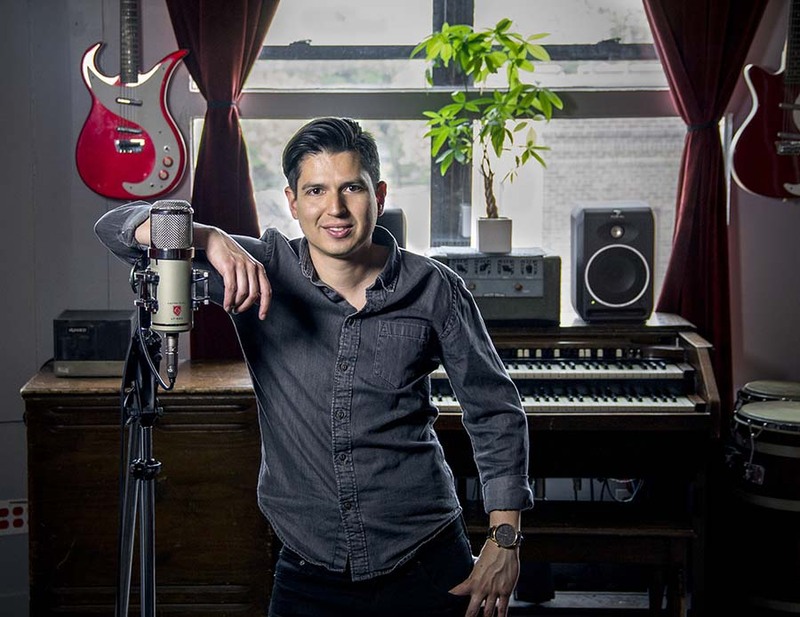 Sanint chose his ‘go-to female vocal mic’ — the Lauten Audio Eden — to record both Michaelson and Bareilles for the song. Sanint discovered Lauten Audio working with Fab Dupont, owner of Flux Studios. “I remember the first time that I tried the Eden,” says Sanint about the LT-386 tube condenser mic, “it was a vocal session that I did here at the studio with a female singer. My typical vocal chain is a Neve pre with some EQ, then I run through the LA-2A for a little bit of compression, that's how I print vocals. I try to not use too much EQ or compression while I'm recording. While recording her, I popped in the EQ, the singer is singing, I'm staring at the EQ and thinking 'I don't really have to do anything' — it sounded great, right off the bat without EQ, and without compression. Ever since then I've been using the Eden on a lot of sessions, mainly for female vocalists — it works very, very well with female vocalists." The producer on the track "Miss America" was Chris Kuffner, Sanint says, "It was a pretty fast session, we got everything done in four or five hours." Sanint continues, “That was one of the reasons why, when Kuffner called, my first choice was to have just a couple microphones up including the Eden. The producer asked me to have a U47 for Ingrid. But knowing that the Eden has great top-end extension and great body, I chose it, as I typically don't even have to use EQ, the mic already has a great tone." "For Ingrid, because the producer had asked me to use the U47, we started with the U47, we did 2 takes, and I had to stop and say, 'Hold on I need to try the Eden microphone’ — because the high-end wasn't there. As soon as we popped the Eden on her next vocal it was such a huge difference! It just jumped out of the speakers right away. Kuffner was asking, 'What microphone is this?!'" Sanint continues, "The other reason I often choose the Eden is because I know it's going to sound good regardless of the type of voice. Also, on a lot of these sessions, the artist comes in and you don't even have time to set your compressor or swap microphones. The singers are super busy, they come in, do three or four takes and then they are out. The immediacy of having a microphone like the Eden that is well balanced, that you know is going to work on any type of voice, is super important for us." Revealing details about the Michaelson session, Sanint adds, "Sara recorded first, to rough vocals of Ingrid's. Sara's voice is just ridiculous, her voice is amazing, it's very rich. Sara did about 5 takes top to bottom, with a few things she wanted to fix on the second chorus, and that was it. Sara was there for about 1 hour, half of which was recording. And Ingrid was the same, we did full takes with the Eden for both of them." The vocal chain on the session was the same for both Sara and Ingrid, Sanint explains, "The Eden mic into a Chandler Limited LTD-1 — that's a 'Neve-esque' mic pre — then a touch of compression on the LA-2A. This is a soft song, there's no belting, it was very intimate, nice and close." Lauten Audio microphones continue to carve out a unique niche for recordists seeking microphones with an original sound. In addition to the Series Black, their product line includes their flagship “Eden” LT-386, the award-winning “Oceanus” LT-381 transformer-less tube condenser microphone, and the FC-387 “Atlantis” solid-state Multi-voicing™ large diaphragm condenser microphone. Lauten Audio microphones have received rave reviews from both experienced recording engineers and leading Pro Audio magazines around the world.